Today, alongside Community Pages and a revamped Interests section, Facebook is also making some changes to its privacy controls. Facebook and confusing privacy settings have long gone hand in hand, which really isn’t a surprise given the huge amount of connections and data sharing that the site keeps track of. To Facebook’s credit, the site continuously iterates on its Privacy control panel to try to make it easier to use. Today though, Facebook has launched a new privacy section that may leave users scratching their heads. It’s called “Friends, Tags, and Connections.” In short, this section is about the data on Facebook that you can’t actually control. You can make it harder to find, and even hide it from your profile, but you can’t remove it entirely. 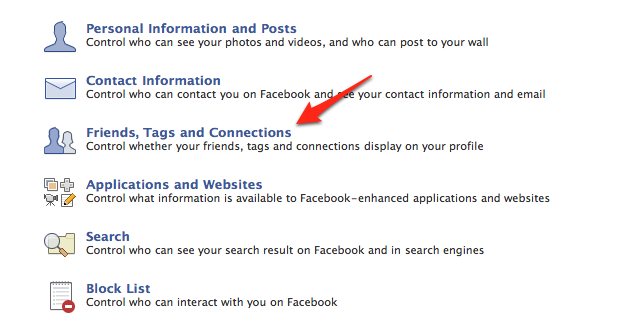 Friends, Tags and Connections covers information and content that’s shared between you and others on Facebook. This includes relationships (shared between you and the person you’re in the relationship with), interests, and photos you’re tagged in. These settings let you control who sees this information on your actual profile. However, it may still be visible in other places unless you remove it from your profile itself. Content included under this section includes friends, family members, relationships, photos you’ve been tagged in, your current city and hometown, and ‘Things I like’ (formerly known as Fan Pages). If you think about it, it makes sense — whenever you’re somehow associated with a piece of content, be it through a friend connection or a photo tag, it’s possible that someone will discover that content through your friend’s profile, even if it isn’t on yours. In fact, many of these settings have existed for years, just under different portions of Facebook’s privacy panel, so it’s a good thing that Facebook is pointing out that they can’t actually be hidden.